« Sunday Morning Bluegrass Gospel in the Garden! Dan Frechette, guitar/vocals, and Laurel Thomsen, violin/vocals will be making their Caltech debut at this show. We are happy to be presenting this fine duo who we expect you will be hearing much more about in the future. They prove that musical magic is not only possible, but as described by The Monterey Herald, “a match made in heaven”. Lyrically refreshing and musically diverse, over the past three years this Canadian-American duo has toured extensively throughout the U.S. and Canada, releasing two albums of their diverse and uplifting original material. 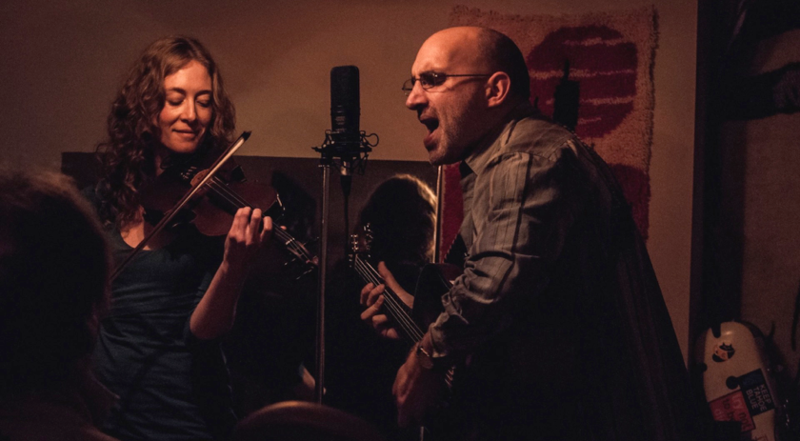 Dan and Laurel take to the stage with exuberance, and as a concert reviewer in Tappen, British Columbia wrote, with “their energy, winsome personalities, and toe tapping rhythms, keep audiences engaged with every song”. Dan is from Canada and he’s written hundreds of songs, with some having been recorded by others, including popular versions of The Mists of Down Below and You Don’t See It recorded by the Duhks. Laurel is an American genre-bending violinist, composer, and respected educator who also writes songs and is doing more and more singing. They are working on their third recording together, so we’re looking forward to hearing their new material. Hear and see them sing Dan’s song, The Mists of Down Below, from Grass Valley last year when they opened for the Wailing Jennys, and check out Little Bird, below. Visit their web site. The show will be in Beckman Institute Auditorium (Little Beckman) and tickets are $15 for adults and $5 for Caltech students and children. Tickets can be purchased on the phone (626-395-4652) with a credit card (a service charge will be added per order), purchased at the Caltech Public Events Ticket Office at the Winnett Student Center for face value (Generally open Monday-Friday 9AM-4PM), purchased online (click on red ticket below- service charge added per ticket, sales end 2 days before show), or purchased at the door for cash or check (no credit cards.) Occasionally, a show will be sold out before the day of the show, so call the Ticket Office, if you are planning to buy tickets at the door. Better yet, join our mailing list and you’ll be informed about such situations ahead of time.